The Ethereum tokens held as collateral on MakerDAO smart contract has been on a constant rise over the past few months. 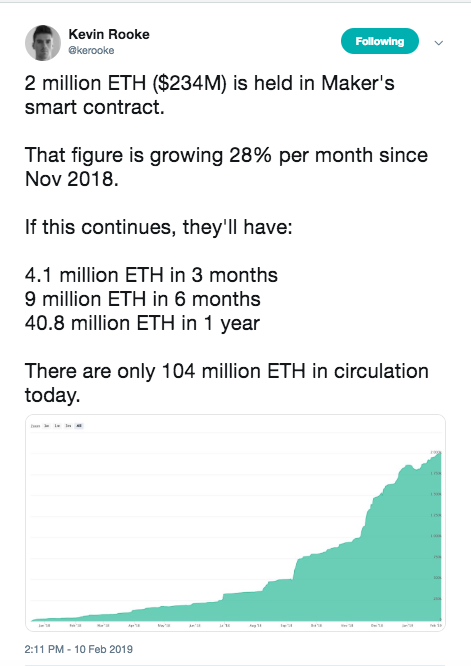 Kevin Rooke, a Twitterati has pointed out that the number of tokens on the smart contract currently accounts to over 2 million Ethereum, worth around $234 million. MakerDAO is a decentralized autonomous organization, which has a stable coin, provides collateral loans and is known for its decentralized governance. DAI, the platform’s stablecoin, is pegged against the US Dollar. It was created with the intention of solving the high volatility of the cryptocurrency market in terms of price. The token is used on the platform as a part of its collateral system. In this system, investors can leverage their Ethereum tokens in order to generate DAI. Following this, users can use this token for other purposes. Here, the leveraged Ethereum tokens are considered as collateral and users will gain control over this token only when they pay back the DAI tokens they had taken.